Showcasing the best providers in the global private banking, wealth management and trusted advisor communities at a European level, the awards are designed to recognise companies, teams and individuals from a prestigious panel of judges deemed to have demonstrated innovation and excellence during 2018. As having innovation and constant improvement in our core, TechRules is delighted to have been shortlisted for these prestigious awards. It is of great motivation to be recognised in the shortlist and this is testament to the hard work and effort that the TechRules´ team have put in all of our solutions during more than 20 years, said Jaime Bolivar, General Manager of TechRules. “The firms who have been shortlisted in these awards are all worthy competitors, and I would like to extend my heartiest congratulations. These awards are judged on the basis of entrants’ submissions and their response to a number of specific questions, which had to be answered focusing on the client experience, not quantitative performance metrics. That is a unique, and I believe, compelling feature. These awards will recognise the very best operators in the private client industry, with ‘independence’, ‘integrity’ and ‘genuine insight’ the watchwords of the judging process – such that the awards truly reflect excellence in wealth management. 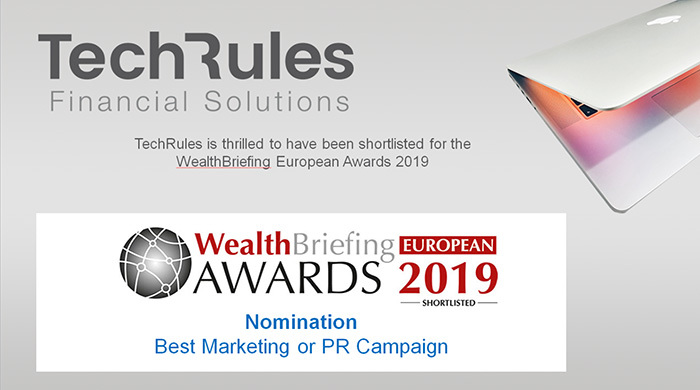 Our aim is to make these annual awards one of the brightest and keenly contested highlights in the wealth management calendar.” ClearView Financial Media’s Chief Executive of WealthBriefing.